Adapted from a lemonade recipe of Paula Deen. In a 1 gallon container, place sugar and hot water, and stir until sugar dissolves. Add lemon juice, lime juice and cold water to render 1 gallon. Stir until well mixed. 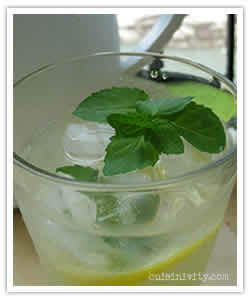 Pour lemonade over glasses of ice, squeeze slice of lemon on top of each, and garnish with a sprig of mint.